When it comes to live music, Local 802 puts its money where its mouth is. 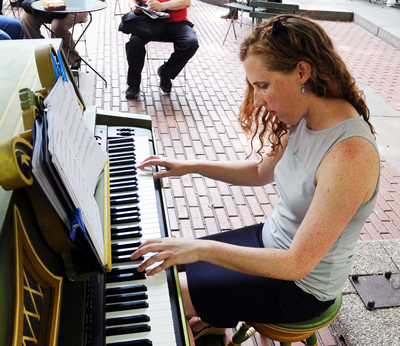 Each year, the union co-sponsors “Piano in the Park,” which provides gigs for our members under a union contract and allows passersby to enjoy the magic of live music. (Other sponsors include Sam Ash, Cobi Narita’s Jazz Center of New York, and the Music Performance Trust Fund.) This year, Bettina Covo caught up with pianist Deanna Witkowski to ask her about what it’s like to play in the open air. For the current schedule, see www.BryantPark.org. This is my tenth year playing in the park; I found out about this series from Cobi Narita, who originally recommended me. For me, part of the attraction is that I live close by, so it’s nice because I can walk here. I love going to Bryant Park in the summer, but also in the winter when they have all the little holiday shops. It’s one of my favorite spots in the city. Playing piano in a park is unusual and unique. I’ve met many people because of this series – people come up and talk with me. I’ve made new colleagues and gotten new students and even some gigs. Some people come to Bryant Park year after year specifically to hear me! I sold a lot of recordings this year. It’s really nice, and more and more, I feel that people are really listening. It makes me plan out my sets more because people are waiting for the next song. In the rest of my musical life, I play different styles of music. Since 2012, I have been working as artist in residence at Park Avenue Christian Church; in May, I began serving as their interim music director. They have a great music program, really eclectic – and because I compose a lot, I write a lot of music for their choirs and congregation. In fact, my most recent recording is all sacred jazz music. This niche has become a large portion of my work all over the country. I also play in the BMI Jazz Composers Orchestra. I have my own trio, and we do some short tours that I self-book. The last tour we did out of town was in January, when we played in Dallas at the Jazz Education Network conference, the Dallas Art Museum, and at a couple of churches. One church (St. Paul UMC in Dallas) did their first jazz service with my trio leading; they had a jazz concert series but had never before had jazz in the context of a service. We put the whole thing together and partnered with a couple of other churches. I also play around town both with my trio and with other people’s bands, including Vanderlei Pereira’s Brazilian jazz group Blindfold Test. Deanna Witkowski has been a member of Local 802 since 2002. For more, see www.deannajazz.com.